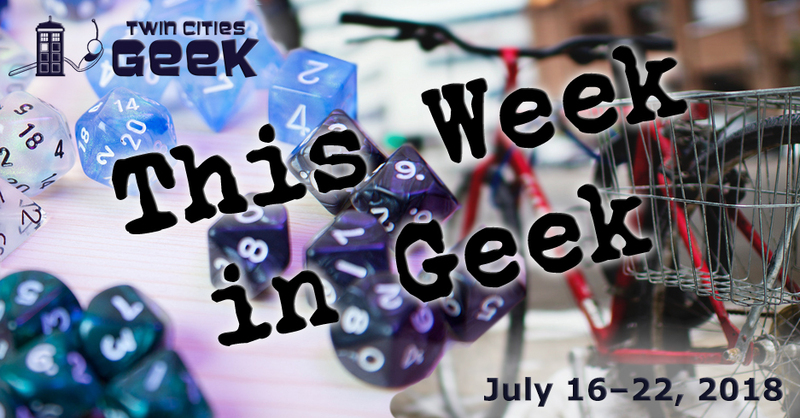 Welcome to This Week in Geek, your guide to events of interest to the Minnesota geek community for the week of Monday, July 16th to Sunday, July 22nd. When: Monday, July 16th at 6:30 p.m. When: Monday, July 16th and Tuesday, July 17th at 7:00 p.m. and 9:15 p.m.
Paul Verhoeven spent much of the ’80s and ’90s in the United States, putting together a slew of geek favorites that were frequently ultra violent, satirical, over sexed, and highly imaginative. The Trylon will be celebrating these works in July, and this week they will be screening a 35-millimeter print of RoboCop, the cult classic about a cybernetic police officer, corporate greed, private policing, and gruesome effects. While you may like to buy it for a dollar, tickets are $8. When: Tuesday, July 17th at 5:00 p.m. When: Tuesday, July 17th at 7:00 p.m. Enjoy a night of community and tea with Tea and Meeples, a weekly gathering of friendly geeks at Panda Castle in Richfield. This week, the group will get together for a night of gaming and enjoy a dinner of mozzarella arepas with summer veggies. When: Tuesday, July 17th at 7:30 p.m.
Come and experience YogaQuest, a blend of yoga and fanfiction storytelling led by certified yoga instructors. Experience a yoga workout experience and a story at the same time. The theme for this week is the Thor: Ragnarok, so fire up the Bifrost and head on down to Blue Box Counseling and Wellness for a night of Asgardian yoga. This event costs $15. When: Wednesday, July 18th at 3:00 p.m.
Raise funds to help animals and play some rad arcade games at Up-Down Minneapolis, an event that puts the fun in fundraising! All the proceeds from your gaming will go to Twin Cities Pet Rescue—who will also be present on the patio with adoptable dogs—so game away knowing you’re helping a good cause. When: Wednesday, July 18th at 7:00 p.m. When: Wednesday, July 18th at 8:30 p.m. Enjoy an evening of community and movie magic under the stars! Movies start at dusk and are free and open to the public. Screening this week is Raiders of the Lost Ark, the classic ’80s whip-cracking adventure film starring Harrison Ford, presented with Spanish subtitles. Check out their complete schedule of screenings this week. When: Thursday, July 19th at 7:00 p.m. The Genome Writers Guild will host a night of public discussion to inspire curiosity about genome engineering and synthetic biology. Speakers at this event include Dr. David Odde, a professor in the Cellular and Molecular Bioengineering Department at the University of Minnesota; Lynn Fellman, an artist who writes, illustrates, and tells stories about the wonder and beauty in our genomes; and keynote-speaker Dr. Ellen Jorgensen, developer of the award-winning Genspace in Brooklyn, NY, and founder of Biotech Without Borders, a nonprofit dedicated to citizen science. Registration is $15. When: Thursday, July 19th at 7:30 p.m. When: Thursday, July 19th at 9:00 p.m. Enjoy an evening of community and movie magic under the stars! Movies start at dusk and are free and open to the public. Screening this week is The Incredibles, Pixar’s Oscar-winning film about family and superheroism. Check here for a complete schedule of screenings this week. When: Friday, July 20th at 4:30 p.m., and Saturday, July 21st at 12:00 p.m. The blues will return to Mears Park with the fifth year of the Lowertown Blues & Funk Festival! There will be a large number of musicians playing, with two stages on Saturday. Artists include: Free and Easy, High & Mighty, Ohio Players, Mae Simpson Band, Scottie Miller Band, the Crow Band, Toronzo Cannon, Chubby Carrier and the Bayou Swamp Band, Marcia Ball, Big George Jackson Blues Band, and the Everett Smithson Band. This event is free, but attendees who want preferred seating can pay $60 per day, or $100 for the weekend. When: Friday, July 20th at 5:00 p.m., and Saturday, July 21st at 9:00 a.m. Learn about the culture of Scotland at this free and family-friendly event. This is your opportunity to hear bagpipes and other traditional-Celtic music, watch burly kilt-wearing men compete in traditional-Scottish athletic competitions, and more. Parking and admission are free to the public, but you can donate to the event if you would like to provide support. This is a smoke-free, dog-friendly, green event. When: Friday, July 20th at 6:00 p.m. When: Friday, July 20th at 7:00 p.m. When: Friday, July 20th and Saturday, July 21st at 11:30 p.m. The Riverview Theater, a neighborhood theater known for affordable second-run cinema, will be continuing its summer late-night programming series with Tim Burton’s spooky cult comedy Beetlejuice—and we’ve already said the name twice so don’t say it again. All tickets are $3, and the theater only takes cash. When: Saturday, July 21st at 10:00 a.m. When: Saturday, July 21st at 11:00 a.m.
Storytelling is an ancient tradition that has persisted through many cultures. Learn to tell your personal story with the help of an expert from the Guthrie. No experience is necessary for this personal-storytelling class. Preregister online for this class with the link provided above, and there are a limited number of seats so make sure to sign up if interested. Dark Energy and Nightchain present Yacht Goth, the second-annual maritime-goth dance party on the Mississippi River. Sail into the dark of night with your fellow goths, and dance the night away in style and under the stars. All-black nautical attire is strongly recommended for this event, which will feature several DJs, including special-guest DJ Jeff Dubois. Tickets are $40, including complimentary food, and this event is strictly 21+, first come, first served. When: Sunday, July 22nd at 10:00 a.m. When: Sunday, July 22nd at 12:00 p.m. Grill, play some volleyball, get some sun, and raise funds for the Minnesota Transgender Health Coalition at this multi-generational queer beach party on Lake Nokomis. There will be two grills in use—one for meat, one for veg—as well as volleyball, a sandy beach, and swag for sale to benefit the Minnesota Transgender Health Coalition. This free event should be a blast, and bring something to grill and share! When: Sunday, July 22nd at 6:00 p.m. The Actors Theater of Minnesota presents a comedy that touches upon every one of William Shakespeare’s plays. This event covers the whole body of work in 97 minutes. There’s no cover charge, and there will be beer specials, and there will be a second show on the 29th if you can’t make it to this one. You make everything sound like so much fun!